CSCvf34445 There were no defects filed with this field notice at the time of publication. Some Catalyst 6500 supervisors and linecards might fail to boot up after a software upgrade or other user actions where the board requires a power cycle operation. Cisco has been working with some customers on an issue related to memory components manufactured by a single supplier between 2005 and 2010. These memory components are widely used across the industry and are included in a number of Cisco products. Although the majority of Cisco products using these components are experiencing field failure rates below expected levels, some components may fail earlier than anticipated. A handful of our customers have recently experienced a higher number of failures, leading us to change our approach to managing this issue. While other vendors have chosen to address this issue in different ways, Cisco believes its approach is the best course of action for its customers. Despite the cost, we are demonstrating that we always make customer satisfaction a top priority. Customers can learn more about this topic at Memory Component Issue web page. A degraded component will not affect the ongoing operation of a device, but will be exposed by a subsequent power cycle event. This event will result in a hard failure of the device, which cannot be recovered by a reboot or additional power cycle. For these reasons, additional caution is recommended for operational activities requiring the simultaneous power cycling of multiple devices. This issue has been observed most commonly on devices that have been in service for 24 months or more. Note: This issue does not affect boards while the boards are in operation. The board failure might occur after one or more of the actions listed are executed. For the affected Catalyst 6500 hardware, no error messages are common in all situations. If error messages are seen, they might have these characteristics. use 'show diagnostic result ' to see test results. Normal SmartNet and warranty entitlement rules remain in place and are applied by the Cisco Technical Assistance Center (TAC) if you experience a failure in one of the products listed in the Field Notice. In other circumstances, such as out of warranty or out of contract, Cisco encourages you to raise your concern directly with your Cisco account team. Fix on Failure Replacement Guidelines: Request Return Material Authorization (RMA) product through normal service support channels. If you need assistance in order to determine which hardware part(s) might need replacement, consult the error messages documented in the Problem Symptom section. For assistance with replacement part disposition, reference this table. In cases where replacing the memory DIMM and/or daughter card is not a viable option, a request may be made to replace the entire card. *The daughter card memory exposure is soldered memory; therefore, only the daughter card must be replaced in order to address exposure issues. 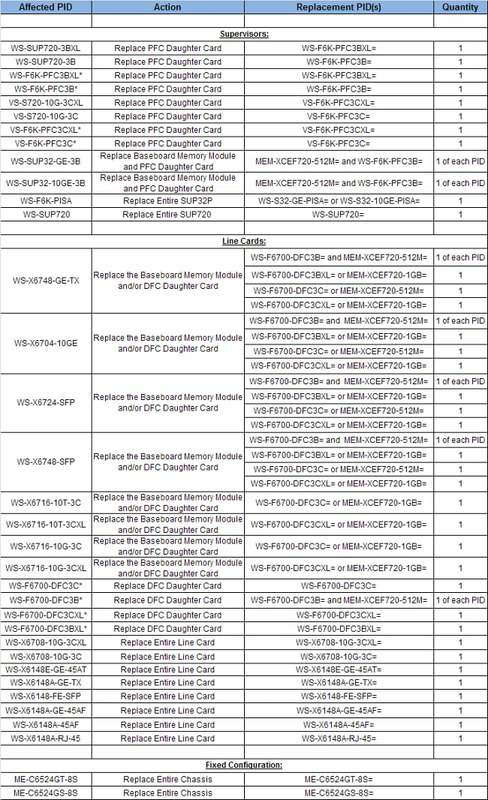 Some daughter cards ship with memory DIMMs for the linecard baseboard as a part of the Cisco default packaging. It is not necessary for these DIMMs to be replaced unless there is exposure on the respective linecard baseboard as well. Enter the show inventory command in order to obtain the Product ID (PID. If the CLI is not available, physically inspect the device in order to locate the PID.